Apart from the eerie whistle coming from the vents and the buzzing and beeping of the drones, it had been quiet for some time. I’d gathered scrap metal and fuel from the abandoned rooms and was all ready to head back until we heard an abrasive thud. Ethan, my gathering drone, headed to one of the rooms we’d yet to discover and heard the banging get louder and more constant, but found nothing out of the ordinary. A message popped up saying something was trying to break through one of the doors to the east of the supposed derelict ship. Suddenly, the mood changed and my heart was in my mouth; Abby, another of my drones was close to the room where the noise was coming from. I tried to pull her away, but something attacked her with great speed, instantly destroying her video link and functionality. The creature made its way through the ship and I couldn’t see it on the map, meaning I had to get the remaining two drones back on my ship as fast as possible. As I tried to recover Tommy (my third and final drone), the alien took it out. Ethan was a few rooms away from the airlock when the alien attacked him as well. Within a minute, all of my drones had been destroyed and my playthrough was over. Duskers is full of moments like this. One minute you can be scavenging and scanning a ship with extreme patience and precision, and the next you’ll frantically be trying to escape the threat of an unknown entity in a claustrophobic and frenzied panic. In Duskers, life has ceased to be and you must piece together what caused the end of existence. 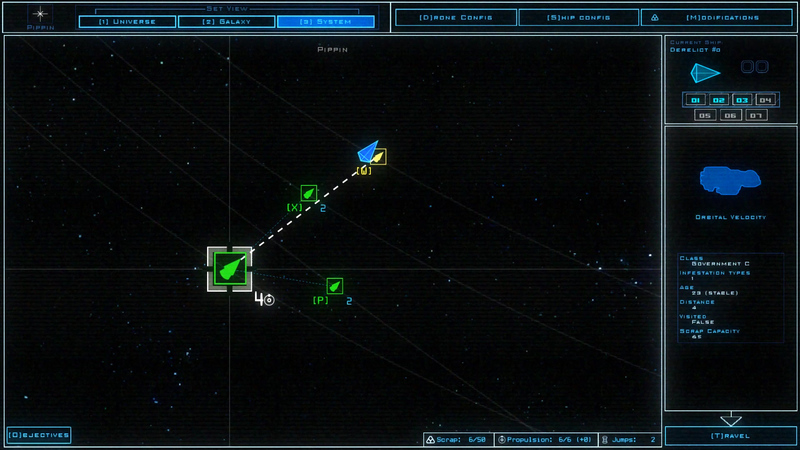 In each procedurally generated galaxy, you must travel to tons of abandoned spaceships searching for scrap metal and lost technology, along with fuel and information. Some ships will offer bite-sized narrative text from their commanders or inhabitants about what’s happened to them, providing just enough to keep you interested on what’s going on. There are no flashy visuals here, and there doesn’t need to be. 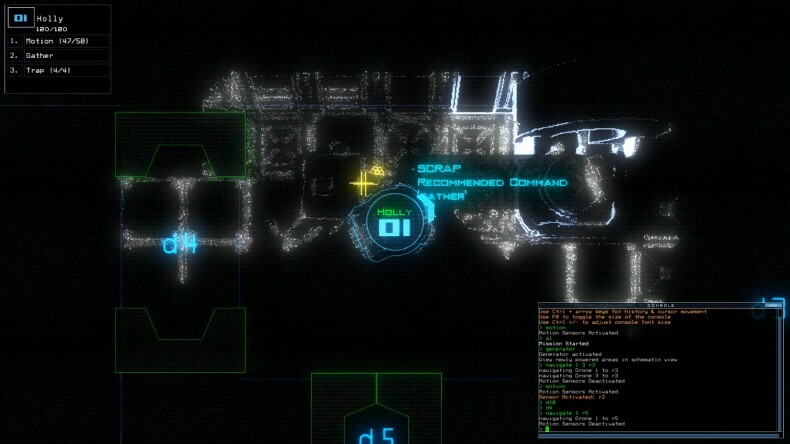 You’re essentially playing the game through a 1980s PC: green text and a poorly powered monitor make the game feel more authentic – like the tech in the Alien films. In fact, the game manages to create the same kind of tension akin to those films and it works all the more better for it. When you’re sending your drones around the ships, the lighting is weak, and many of the areas are dark so when you bump into something unexpectedly, you panic and the instant fear hits every inch of your body. You control your drones solely with the keyboard through a command box and the arrow buttons (think command prompt and DOS). This also adds to the retro feel, making the mouse redundant and requiring quick fingers and a calm nerve for when things go bad (which they will, a lot). You can skip between the drones by pressing their assigned number and move them with the arrow keys. Each drone will have different abilities which you can assign to them back in your ship (more on this later). To execute an ability, you simply type it in; for example: when one of your drones has the generator ability and finds one without power, type in ‘generator’ and it gives power to a specific area of the ship. If you need to scan some of the rooms, type ‘motion’ and it will scan a couple of the rooms you’re close to. There are plenty of abilities in Duskers and each one will play a role in how successful you are on a mission, but sometimes the most vital abilities are absent when a new galaxy is generated for you. There are other commands you can input which help moving around quite a bit. By pressing ‘navigate 1 2 r1’, you can send drones 1 and 2 back to your ship (r1 = room 1). 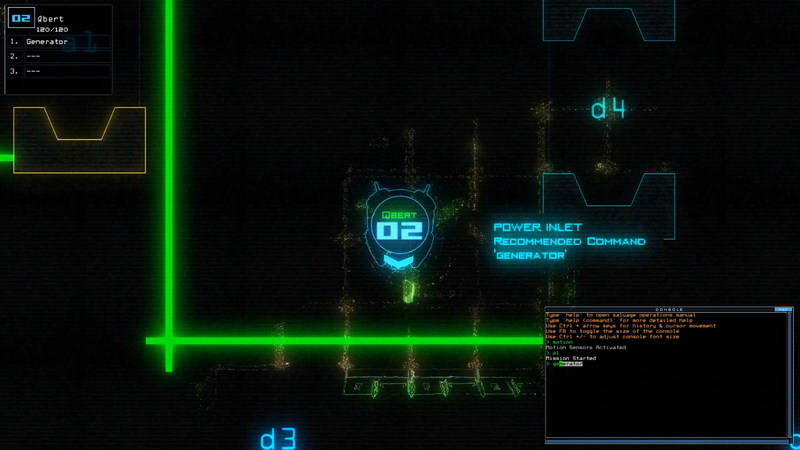 If you use a semicolon between commands, you’re able to link multiple commands together; ‘a1; remote; navigate 2 d12; navigate 3 r 3 interface; navigate 1 r11 gather’ will mean absolutely nothing to you now, but this chain of command will remotely power the ship whilst one of your droids hacks into its network and another picks up some fuel and scraps. When you aren’t searching an abandoned ship, you’ll spend some time upgrading and repairing your drones from your own spaceship. All the scrap metal you find helps to restore health to your drones and increase the amount of health they have along with other variables. Some of the drones you tow back to the ship have abilities you won’t already have and they can be swapped between all of your own drones. All of the fuel you find will help you travel to new ships by way of the propulsion you’ve stocked up on. You’ve also got an faster-than-light drive which will help you jump to other systems in the galaxy, bringing more difficult ships to explore and survive on. There are various threats ranging from aliens to rogue droids, and every ship is different in size and infestations. When all of your drones are destroyed, you can reset the game and start all over again. Sometimes, starting again with a weaker loadout can be frustrating, and having a difficult beginning can result in a short survival time. It’s not enough to diminish the fantastic experience you’ll have when playing Duskers, and it does help to change the way you plan and prepare for certain missions. Duskers is a fantastic rogue-like game that has you on the edge of your seat and always keeps you on your toes. Review code provided by developer. Duskers is a highly original game that features one of the greatest, most atmospheric environments I’ve seen in a long time.